Explore the Bible with your child while cooking through 20 delicious recipes! 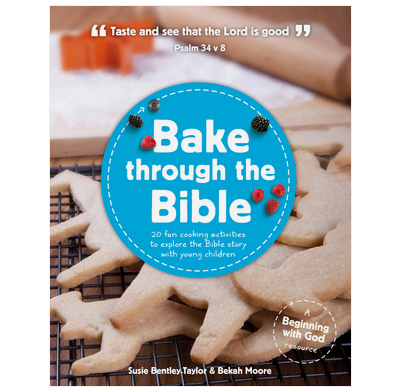 Bake through the Bible helps parents with young children to explore the Bible with their child while having lots of fun cooking together. Download the authors interview (98MB). This book contains 20 Bible stories, told in a simple, engaging style, that take your child through the whole storyline of the Bible. Each story is supported by a cooking activity that reinforces the main teaching, along with questions to discuss while cooking, and a simple recap to use when enjoying what they’ve cooked. You don’t have to be a good cook—just ready to have some fun as you Bake through the Bible! 8.5" x 10.6" x 0.2"
I am so thankful for this brilliant resource! We are now four sessions into using 'Bake through the Bible' at our lunchtime Bible Club at school. We only have half an hour and lots of children, so we take all the short-cuts with the baking, but the teaching points are so clear and concise- its just right for the childrens' attention span. The kids (from 4-11years) absolutely love the food related activities and it has helped them to recall the previous learning from the weeks before. It's a great introduction to the Bible for these children and I am absolutely thrilled to have found it! Thank you for putting this resource together and for sharing your wonderful ideas. The 7 year old little girl whom I gave the book to said it was 'awesome'! I really liked it as the cooking instructions were clear and the links to the Bible stories were great. A really good way to learn about the Bible in a fun way. My feeling about the 'Cooking through the Bible at Christmas' was the same only I felt the recipes were more interesting so I would rate that at 5 stars. I bought this book for my mother to use with my niece and nephew. Though their parents are not yet believers, the children LOVE the book and the recipes. My 5 yr old nephew attempted to be uninterested, but upon reading the first story all other toys went to the ground and both children were captivated. Moving in to the kitchen to make creation cookies... the kids absolutely loved it! "Nana makes the best cookies" apparently. The promise cookies - were also a lot of fun - it was great hearing them tell us some of God's promises, though my niece did improvise and add pink food colouring when making the cookies! I cannot recommend this book enough and pray hard that it leads to ultimate commitment to Christ for all using this exciting and relevant resource. I bought this book for our small Sunday school to use throughout the summer holidays. It has great ideas, it is clearly laid out (I'm dyslexic, so that's very important to me), and logical to use. Looking forward to doing these recipes with out 3-7 year olds. I loved this book.. I liked the style of the bible story background and the way the book is laid out. I thought that it would work with primary and with teens even to use with young children. Some of the ideas you may already have used but the layout is very attractive and if you knew a person interested in cooking with kIds I think it makes a cultural extension idea that presents Bible truths in a clear but non threatening way. I think the main thing is that it gets over the sincerity and enthusiasm and excitement of the authors. Well Done! I bought this for my sister-in-law as a gift, as her children are still the right age for this - plus she's a Sunday school leader, so appreciates lots of ideas. But being a youth and families worker, I've had a good look to see if its worth a punt for me. It's well laid out, in that there is the story, questions to ask, practical, illustrated instructions, a prayer to say etc. There are ideas to lead children's thoughts through the activity and a prayer. It is, of course, far too abstract (for teaching effectively, I mean, not lovely thematically related activities) for children they say they're aiming at (as I see their children in the promo). It can be used as a teaching resource effectively for Bright 4 year-olds to Junior School children. It could be used in the home, if you're that sort of Mum (some of us are, some aren't), but it would be a useful resource for all kinds of workers with children and families. If you are an experienced worker, you will probably thought of - and maybe done - some of these ideas or versions of them anyway. My colleague and I looked over my (sister-in-Law's) copy with appraising, experienced eyes and liked the layout and structured ideas - always something to learn there! We always think that the making/craft time is the best time to get alongside children and to let them tell us their thoughts, tell us about their lives, etc., so good to think about structuring/directing that more. NOTE: with the clean and dirty hearts I would use white and brown chocolate rather than jam and brown choc, which doesn't have the same visual clarity. I am so pleased with this book! It's really well designed, easy to use, and combines gospel-focused stories with great cooking activities. I'm really enjoying using it with my little one, but I also hope to use it with Mums from my local toddler group, get them over with their kids, and hopefully it'll be a great opportunity to speak to them as well! Great concept and really well produced. And can I say that creation cookies are VERY yummy! This book arrived yesterday (great service Good Book Company) and I LOVE it! I'm going to use it in one of my after school clubs this year as it will work perfectly with the group - aged mainly around 6-8. A lot of the group have additional needs and this will be a great way to involve all their senses and keep them actively engaged with the story. Great idea, have been recommending it to many friends and really looking forward to seeing what some of the children create!